← It’s World Turtle Day! “Cantankerous puffs of adorable”: perfect! Great photographs of the beautiful herons! When you see how much they work — wow! Thanks so much; I wish the photos were a bit better, but they were really tucked in there. Hahahh!! Love it…. It’s like “my” mockingbirds. Each year, they set up house near my doorway, and right outside the garage. And they love to dive-bomb! I always apologize to them for getting in their ways, lol. How sweet to have been whitness to the goings on. How dry my life would be without all the birds and beasts. You’re so very right… It touches my heart and soul each and every time! I don’t know what I’d do without such scenes and without this life. So true.. I was watching the scene unfold more than I was snapping it, it was such a hoot. The poor overworked mama, though! Wow…. Puffs of adorable is right! And, you captured that beautifully in your photos! Gorgeous. Thanks so much! I was watching the adorable chaos more than I was snapping it, honestly. I don’t know how wildlife survives… So much WORK. Fantastic title for the post. There’s nothing like demanding kids to ramp up the noise level. Heh, thanks. And the mama didn’t make a peep — poor thing was exhausted, you could just see it. 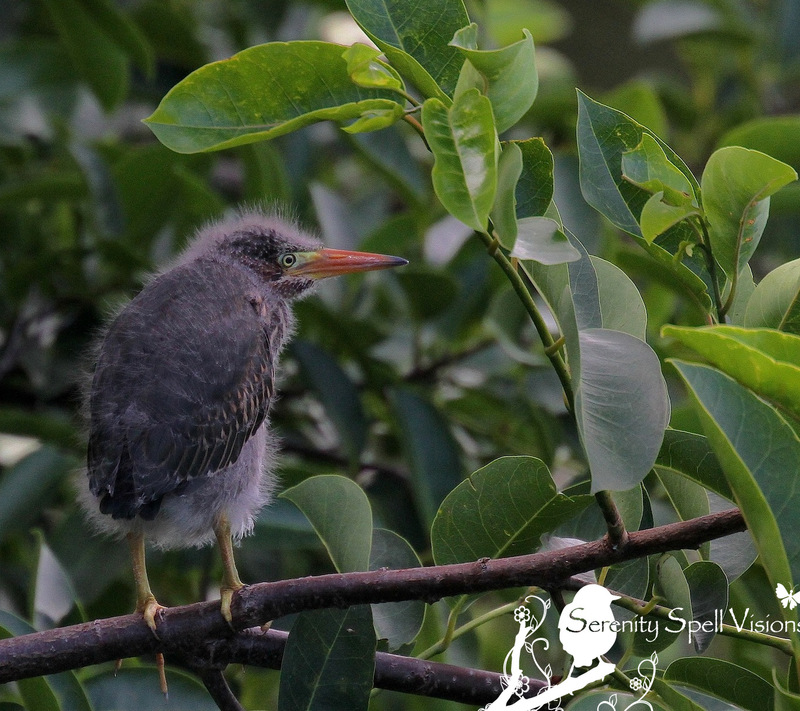 I’ve never seen a green heron chick, but that’s probably because I avoid their nesting sites if I can. Thanks for the photos of them, now I know what they look like. It’s impossible to avoid nesting sites in this particular preserve — rookeries galore. But these urban wetlands and their inhabitants are carefully protected by human visitors, fortunately. On my hikes in the ‘glades, it’s definitely near-impossible to be afforded such a glimpse! 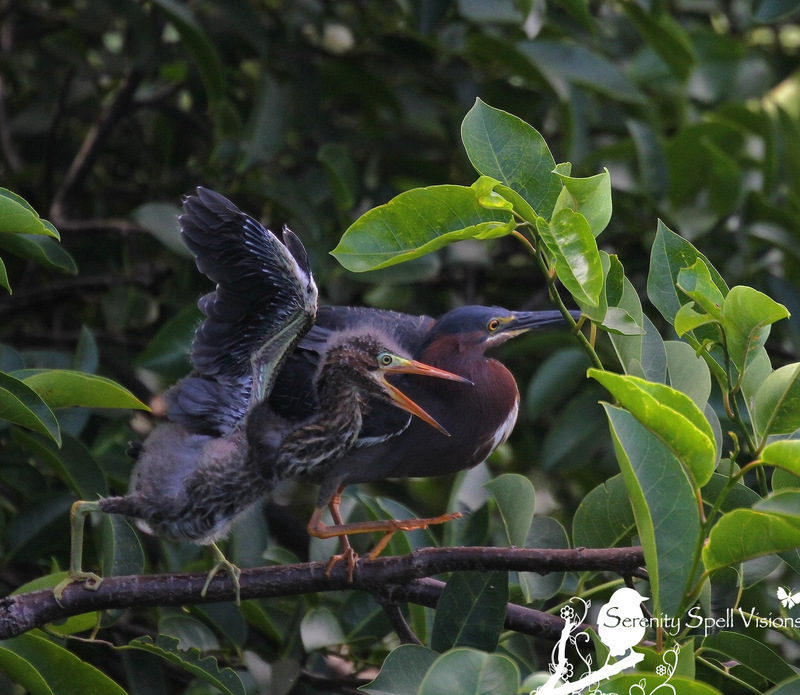 The Green heron babies are so sweet! Aptly named post! Great shots. Awww…so cute! Love the little greenie babies! Tremendous shots! Adorable! It’s fun seeing little critters from across the country up close and personal… Here in San Diego I mostly encounter ground squirrels and seagulls. I bet you guys have lots of sea and shorebirds, though! So cute! I’ve never seen them fuzzy like that. Send some of that rain up to Tampa. We need it bad. Wow, you guys aren’t getting our rains on your coast? I’m surprised, and so sorry! Another Florida gal in the north mentioned the same (no rain, send some)… So here’s to pushing it your way!! I was just out photographing these cuties today! Wonderful! 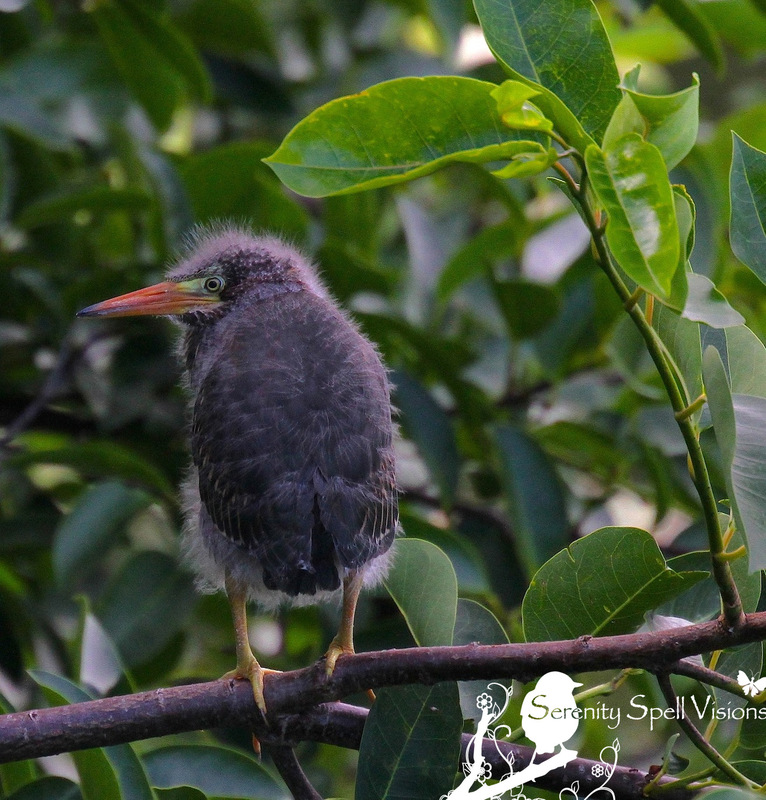 Actually I saw tricolor heron babies – they are so funny! Pictures will show up sometime soon. Got lots to sort from California trip and all this activity here in Florida. Great place to live! Adorable they are! I envy your rain and I’m in awe of the land there that is able to take that much! I would love to spend time in the Everglades! Wow, I’ve never seen a chick of these Green Herons, and you did it, great!!! You never know what you might see out walking! I love that one too! I wish it weren’t so dark (they were really tucked in there, on a dark day)… Little one so cantankerous, and poor mama, so harried! 🙂 You’re right though… It’s when you’re not looking, when the surprises occur. Those birds truly are adorable! Fabulous shots. Thanks so very much! I was thrilled to have been there at the right time… 🙂 They’re such sweethearts. Truly, truly a cutie. Thank you very much!!! Love your Gravatar photo Marialla. Ah, aren’t they the sweetest? Thanks so very much… I was just lucky and happy to have witnessed the event! 🙂 Poor mama, though! Busy girl…. Thanks so very much!! 🙂 They’re absolute sweethearts…. I had never seen green heron babies before. I loved their puffy cantankerousness! These are awesome powder puff balls ! I bet you’re so happy to see these little ones. Hope the mosquitos didn’t come out in droves after the rain. I’m in Gainesville next week to visit mum. I bet in the swamps those nasties are in FULL FORCE! Argh!! Oh no, I’m going north this Friday…2 days!! But I’ll be up there for a week-and-a-half (work + family)! What! We’re going to be passing each other in the sky!! That’s just not right !! Let me know about your longer visit though. The 12th ? I’ll be back by then. Just there for a few days. Ohhh, maybe I’ll drag my brother to that fun jungle-gym of yours then, hahah! When I showed him, he said… I’m not training to be a Navy Seal. Lol. If you study the little ones from eye to the tip of their beak – you come across such a wealth of colors! I love what you commented above about mockingbirds – they fear nothing! Also blackbirds – I was walking through a parking lot, when suddenly I felt my hair being tugged (it hurt!). I turned to my side and there was a little blackbird, perched on a car, giving me the eye as if to ask me to state my business, and would I be leaving anytime soon. A bird’s parental inclinations – you have to love it! Hah — that’s *exactly* what struck me, even in the camera’s tiny viewfinder… The depth and wealth of colors spreading across the tiny beak! Isn’t it glorious? You’re the first to comment on that, too… But that’s my absolute favorite part of the entire capture. Just brilliant. At least these parents don’t have a cuckoo chick! Or the equivalent..a GIANT heron 🙂 Absolutely gorgeous photos. Too late! Shenandoah is stuck on my mind! 😀 Thank you Christy. I promise to commit this name to memory from henceforth! Hahah! 🙂 I personally love Shenandoah Jelly-bean. You’re sweet. The perfect headline! Great photos. Hee, they really are loud, seemingly ornery guys, aren’t they? Especially the babies! Poor mamas (and dads, sorry — they do the work too!). Had to weigh in to agree that your headline is perfect and as perfectly cute as your subjects!! I love a baby bird as much as the next person, but it’s the devotion of the parents that really gets to me. My blue jay babies still haven’t fledged, I guess. But the parents have come to my feeder for three years now – I don’t have a doubt it’s the same pair. I can’t even count the number of trips they make each day, starting just at sunrise and often pushing it to make “one more run” before the sun goes down. It makes me nervous when we have a real storm, wondering about the nests. But apparently they have the blueprints tucked in a drawer, and can make repairs “on the fly”! Heh, thanks so very much!! The way this little one was behaving, was just that. It was a fantastic scene. Thanks so very much! I was incredibly lucky to spy them in the trees; they were so well hidden…..